Snake Boat Race next week! Yes. It’s about to happen. Saturday week, August 8th will see the backwaters at our Alleppey come alive with the sound of swishing water, big crowds and high adrenalin because it’s Snake Boat Race day. Here again is a little peep into what is one of Alleppey’s biggest events. It’s said that this sport that has the highest number of members in a single team ever. So expect upwards of 100 men (and in recent years there have been some all-females teams too) rowing in unison to the rhythm of the boatman’s chants. And many of these male rowers will be naked to the waist, girls! Steeped in the history of Kerala these boats were crafted originally by a Maharajah who was fighting from his boat in the canals of Alleppey. When he lost his battle he had a secret new boat design crafted for him. India’s sacred texts were brought to bear and so gleaming historical information from the Sihapathya Veda the Snake Boat was born. To this day the construction remains over 100 feet long with the rear end rising up to a spectacular 20 feet. The front of the boat then tapers to resemble a snake with its hood raised. Hence Snake boat. 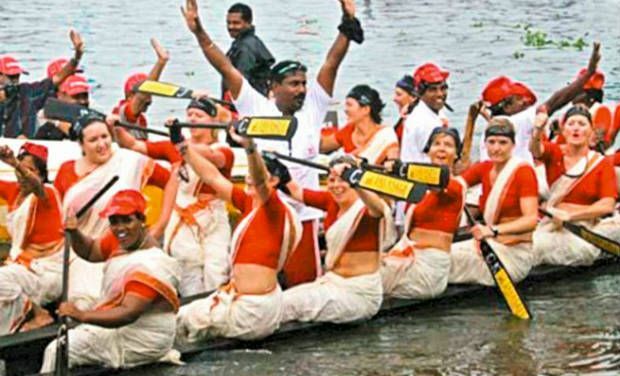 When Jawaharlal Nehru visited Alleppey in 1952 he was so taken with the spectacle that he donated a trophy – hence this major event on August 9th is known as the Nehru Trophy Snake Boat Race. Woo-hoo! 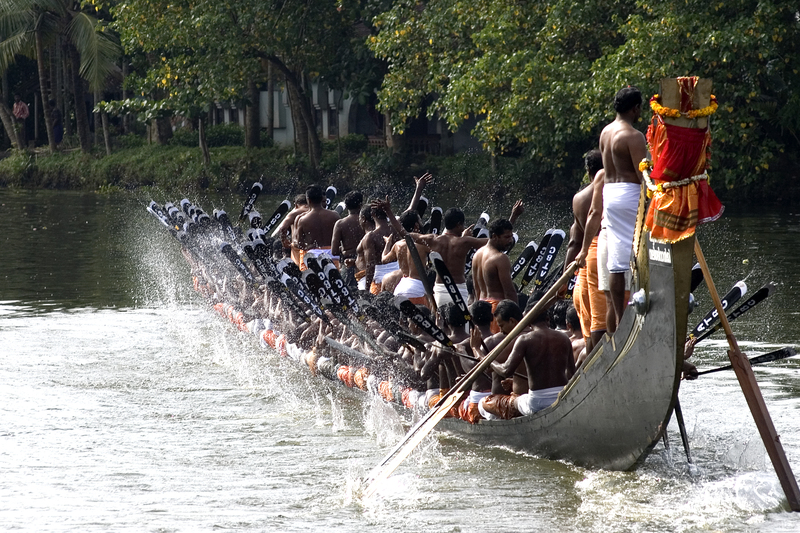 The Alleppey Snake Boat Race. One of the great highlights of our year. You MUST come! Take note: it is indeed a boat race but it has nothing to do with real live slimy creatures.